WHAT COULD BE more deliciously bold than a gift of New England apples this holiday season? Imagine the pleasure of receiving a box of fragrant, fresh apples, a jar of creamy smooth apple butter, a bottle of our region’s finest apple wine or hard cider, or a stunning wall calendar packed with photographs and descriptions of many of the apples that flourish on our soils? If you are feeling especially generous, you could package one or more of these apple items with something rarer still: the gift of your time, and the thoughtful care that goes into baking an apple pie, cake, or bread. Many New England orchards offer locally grown apples, gift baskets, and homemade apple products through their websites. Just visit New England Apples and link to Orchards By State or Find An Orchard for ideas, or to find that special apple you are looking for. Maybe it is one of our classic New England varieties like McIntosh or Cortland, coveted but impossible to find in many parts of the country. Maybe it’s the sensational Honeycrisp, one of the newest and juiciest of apples. Or perhaps a box of gift-wrapped box heirloom varieties with histories as rich as their flavors, like Calville Blanc d’Hiver, Lady, or Cox’s Orange Pippin. New England has a thriving cider business, and many of the new generation of hard ciders approach the quality and complexity of fine wines. Similarly, why settle for bland, generic apple preserves, salsa, or butter, when you can choose from among the many made here in New England with our distinctive varieties? 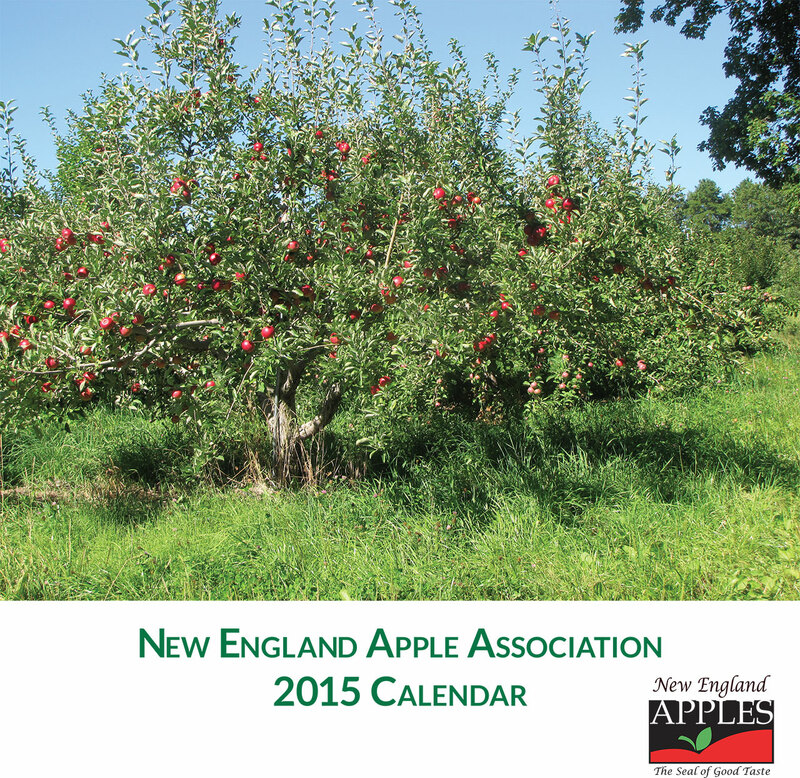 OUR 2015 New England Apples wall calendar is now available. The 12”x12” calendar features orchard photographs by Russell Steven Powell and Bar Lois Weeks from throughout the region, and different apple varieties each month, with extended descriptions. The inside back cover lists New England orchards by state, and how to contact them. To order your 2015 New England Apples calendar, send $12.95 each ($9.95 plus $3 for shipping) to: New England Apples, P. O. Box 41, Hatfield, MA 01038. Make checks payable to New England Apple Association. Calendars will be shipped on the day your order is received. IF YOU WANT TO MAKE a big impression on a special someone, here is a recipe that came to us from someone who referred to it in reverential terms. She has made it more than once and served it to appreciative guests. The inspiration for the recipe is The Gift of Southern Cooking by Edna Lewis and Scott Peacock. We substituted walnuts for pecans. It didn’t matter; apples and caramel go well together, no matter how you slice it. Butter a 9”x13” baking dish. Blend together sugars and oil in a large mixing bowl. Beat in eggs one at a time. Combine flour, baking soda, cinnamon, nutmeg, and salt, and gradually add to the batter, mixing just until well blended. Stir in apples, nuts, and vanilla, and pour into baking dish. Bake until a toothpick inserted into the center of the cake comes out clean, around 70 minutes (begin checking after an hour). Remove from oven and cool in dish while preparing glaze. To make glaze, melt butter in a saucepan. Add sugars, and stir until blended. Cook over medium heat for 2 minutes. Slowly pour in cream, and bring to a boil. Continue cooking for 2 minutes, stirring constantly. Remove from heat. Using a fork, poke holes in the surface of the cake and pour warm glaze on top. Serve cake warm or at room temperature. ALL THE APPLES have been harvested. Those that are not sold right away are rushed into cold storage. Between now and next summer, the apples will be packed and sold in a variety of ways. Watch this video to see how the apple gets from tree to grocery store. Is there an orchard who will ship to Florida? A number of orchards will ship to Florida. What kind of apples are you looking for? There are orchard listings on the website newenglandapples.org.